An engineer and interior design graduate, Shailaja is a passionate entrepreneur who loves the fashion industry. 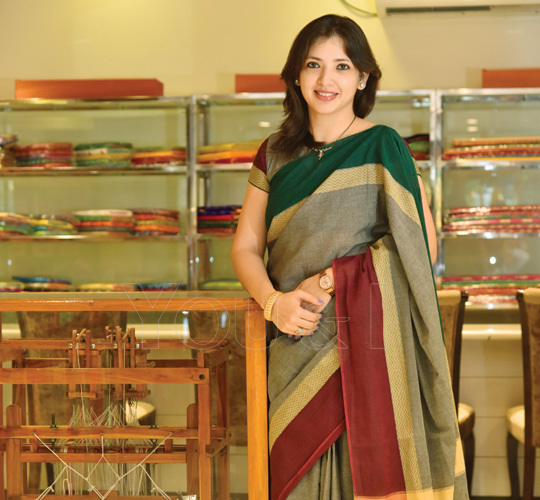 She began her journey in textiles with Srinivasa Textiles, a four-decade-old family-run business. 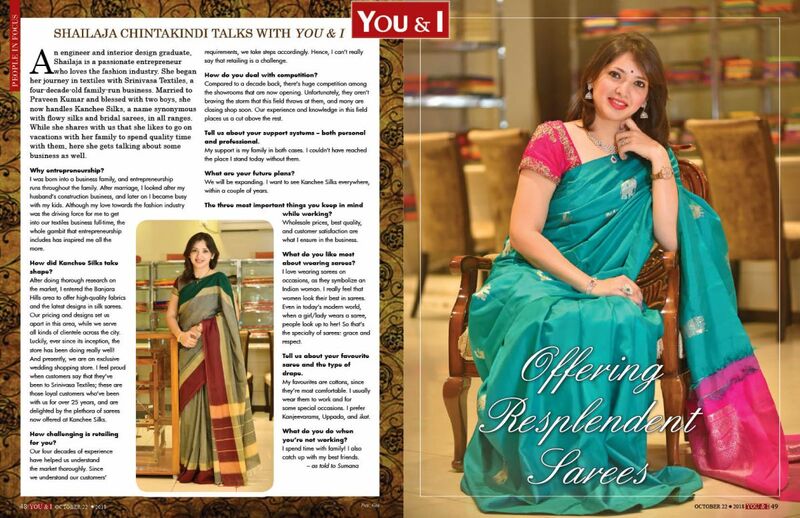 Married to Praveen Kumar and blessed with two boys, she now handles Kanchee Silks, a name synonymous with flowy silks and bridal sarees, in all ranges. While she shares with us that she likes to go on vacations with her family to spend quality time with them, here she gets talking about some business as well. I was born into a business family, and entrepreneurship runs throughout the family. After marriage, I looked after my husband’s construction business, and later on I became busy with my kids. Although my love towards the fashion industry was the driving force for me to get into our textiles business full-time, the whole gambit that entrepreneurship includes has inspired me all the more. How did Kanchee Silks take shape? After doing thorough research on the market, I entered the Banjara Hills area to offer high-quality fabrics and the latest designs in silk sarees. Our pricing and designs set us apart in this area, while we serve all kinds of clientele across the city. Luckily, ever since its inception, the store has been doing really well! And presently, we are an exclusive wedding shopping store. I feel proud when customers say that they’ve been to Srinivasa Textiles; these are those loyal customers who’ve been with us for over 25 years, and are delighted by the plethora of sarees now offered at Kanchee Silks. How challenging is retailing for you? Our four decades of experience have helped us understand the market thoroughly. Since we understand our customers’ requirements, we take steps accordingly. Hence, I can’t really say that retailing is a challenge. Compared to a decade back, there’s huge competition among the showrooms that are now opening. Unfortunately, they aren’t braving the storm that this field throws at them, and many are closing shop soon. Our experience and knowledge in this field places us a cut above the rest. Tell us about your support systems – both personal and professional. My support is my family in both cases. I couldn’t have reached the place I stand today without them. We will be expanding. I want to see Kanchee Silks everywhere, within a couple of years. The three most important things you keep in mind while working? Wholesale prices, best quality, and customer satisfaction are what I ensure in the business. What do you like most about wearing sarees? I love wearing sarees on occasions, as they symbolize an Indian woman. I really feel that women look their best in sarees. Even in today’s modern world, when a girl/lady wears a saree, people look up to her! So that’s the specialty of sarees: grace and respect. Tell us about your favourite saree and the type of drape. My favourites are cottons, since they’re most comfortable. I usually wear them to work and for some special occasions. I prefer Kanjeevarams, Uppada, and ikat.